Engrave a message of love on this Gold Over Sterling 2-Piece CZ wedding ring set. Declare your love with this lovely 2-piece wedding set. The Gold Over Silver engagement ring features a brilliant-cut solitaire CZ and dazzling square-cut CZ's. The wedding band also features illuminating channel set square-cut CZ's, for added dazzle. For an extra special touch, personalize this wedding band with an engraved message of your love, up to 15 characters. Engagement band center stone is 8mm round and totals 3.64 carats. Sterling Silver set totals 6.61 carats. Our ring sizes are consistent with what you’d find at your local jewelry store. Please note that by visiting your local jeweler, you will get the most accurate ring size measurement. For your convenience, we have provided several options for determining an accurate ring size for yourself or someone else. 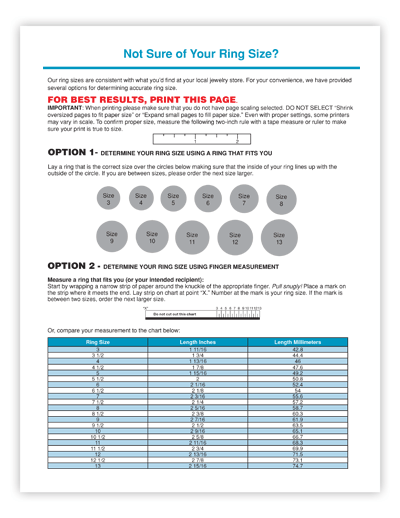 To use our convenient ring size finder, just follow the simple steps below. 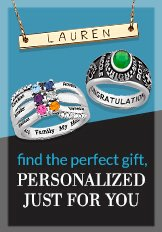 1) Click here to download the ring size finder shown below. 3) In the PRINT box, make sure that you DO NOT SELECT “Shrink oversized pages to fit paper size” or “Expand small pages to paper size.” Double check that page scaling is set to NONE. 4) Follow the easy instructions on our ring size finder. Review & Approval I confirm the personalization indicated above is correct.